Please note that all of our scholarships for Career Online High School are in use – and we’ve even had one graduate! We are sorry we are unable to enroll more students at this time. If additional scholarships become available, we will announce them here. However, don’t be discouraged – there are lots of options in Waukegan to help you reach your goals. You can reach out to the Library at 847-775-2547 for assistance: we can help you enroll in another adult learning opportunity right here are the Library, or connect you to another organization that can help. Reach your dreams at the Library! We’re excited to offer a limited number of scholarships to adult learners ready to earn their diplomas and advance in their careers. 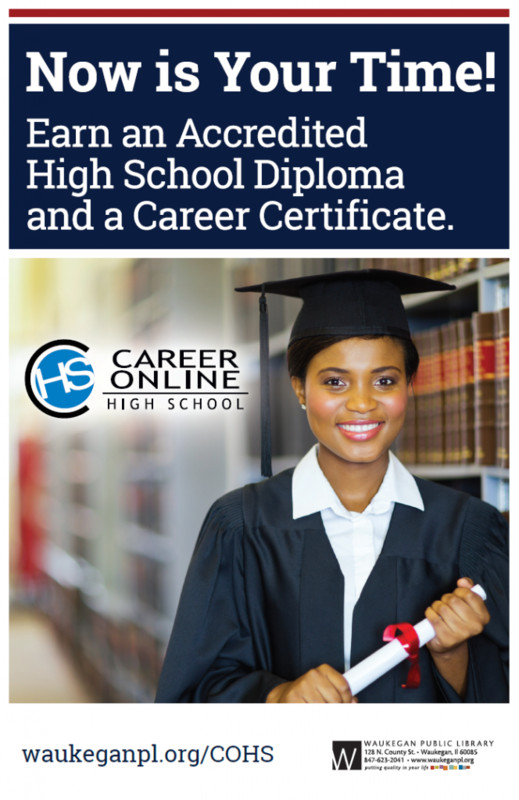 Career Online High School (COHS) is an online high school diploma and career certification program. Students will receive all the support they need from a personal academic coach and the Library team to earn their diplomas within 18 months. Students will also graduate the program with a career certificate, which shows employers that students have the background knowledge they need to be successful in their field. Students who qualify for the program must then pass an online self-assessment test. If students successfully pass the self-assessment, they must then complete a prerequisite course within 30 days. When the prerequisite course is successfully passed, students may then accept their scholarship and enroll in the program! Learn all about the program here. Contact the Adult Learning Specialist to learn more at adultlearning@waukeganpl.info.